Sometimes, it's a bid for attention. At other times, it's a test of your parenting skills to see how you'll react. Proactively teach your child skills that will prevent him from exhibiting disruptive behavior. Teach empathy so he can understand how his rude behavior affects those around him. Pause when you're reading books to ask questions about how a character's behavior affected the other people in the story. Also, teach healthy ways to deal with uncomfortable feelings. Show him how to cope with anxiety, fear, loneliness, or rejection without acting out. Kids often misbehave as a means to get attention. Giving your child attention for behaving can prevent him from acting out. Rather than scold your child for interrupting every time he butts into the conversation, pause when you're talking to a friend and say, "Thank you for playing so quietly." Praising good behavior can encourage your child to keep up the good work. And it will show him that the best way to get attention is to follow the rules. If your child’s obnoxious behavior is purely attention-seeking–like making loud noises repeatedly at the dinner table–ignore it. Selective ignoring can ensure that your child’s misbehavior isn’t effective in getting him the attention he's trying to attract. Ignoring will only work if everyone in the family is able to be on board. If a sibling is likely to cover her ears and repeatedly yell, “Stop!” her reaction will only reinforce to your child that his obnoxious behavior is effective in getting a reaction out of someone. So it's important to make sure everyone is on board and able to ignore the obnoxious behavior. If not, you might be better off trying a different strategy. 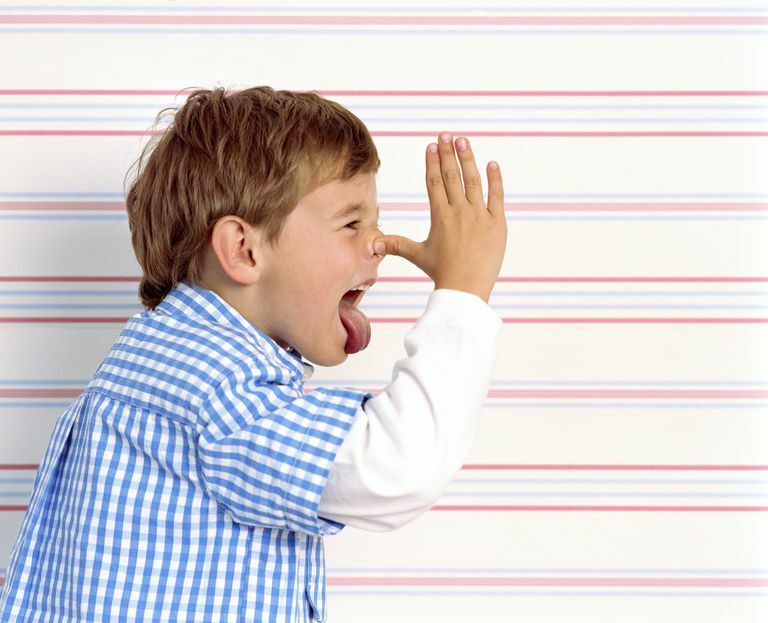 If your child doesn’t recognize the type of behavior that is likely to annoy others, point out obnoxious behavior when it occurs. If your child is showing off when you have visitors, he may think he’s entertaining people. Or, if he’s not sure how to invite other children at a playground to play with him, he may act out in an attempt to get their attention. If you’re in private, simply saying, “Please stop. Those loud noises are annoying." A little reminder like that may be all you need to say. If it’s a public situation, call your child to the side and privately explain that his behavior is inappropriate. Say something like, "I know you want the other kids to play with you. But blocking them from running across the bridge is annoying them. Ask them if you can play with them rather than interrupt the game they're already playing." You may also want to create a code word or a signal so you can point out obnoxious behavior in public without embarrassing him. Saying, "Nice shoes," or "Be kind," might serve as ways to point out he needs to change his behavior. If your child chooses to continue his obnoxious behavior once he’s aware that what he’s doing is disruptive, provide a warning. An if…then statement is an effective way to remind him what will happen if his behavior continues. Say something like, "If you don't stop banging that right now, you're going to go to time-out." Only offer one warning and be prepared to follow through with a consequence. If your child doesn’t heed your warning, it may be necessary to follow through with a negative consequence. Time-out is usually an effective consequence. Remove him from the situation and stop giving him any attention. If the obnoxious behavior turns aggressive, or if a time-out isn’t an option, take away a privilege. Removing electronics for a day or taking away a favorite toy for a few hours can help your child learn. If the obnoxious behavior is an ongoing problem for your child, it’s important to problem-solve the issue together. Before you enter into a situation where disruptive behavior is likely to occur–like the car or when visiting Grandma–talk about your expectations up front. Discuss what your child can do if he’s bored or how he can get attention in a more positive manner. You might decide to pack a coloring book and crayons. Or, you might offer a little reward he behaves the entire time. Say something like, "If you follow the rules at Grandma's house today we'll stop and play at the playground on the drive home." Graziano PA, Hart K. Beyond behavior modification: Benefits of social–emotional/self-regulation training for preschoolers with behavior problems. Journal of School Psychology. 2016;58:91-111.